Tony Blair says he is "not sure it is possible" for Labour "moderates" to take the party back from the left. The former Labour leader told the BBC's Nick Robinson Labour had been through a "profound change" under Jeremy Corbyn. "It is a different type of Labour Party. Can it be taken back? I don't know," he said. Mr Corbyn responded: "I think Tony should recognise that party membership is now much bigger than it has ever been." Asked about his predecessor's comments, the Labour leader added: "I've been in the Labour Party all my life. I am a socialist. I am determined to see a fairer and more equal society. "That's what the Labour Party exists for. We're there for human rights. We're there for social justice. We're there for the future of the people of this country. "It's not personal, it's about us as a movement. That's why we were founded. That's why the party is so big. And that's why I'm so confident that we are continually challenging this government and we will win a general election." Mr Blair's intervention comes as two more Corbyn critics lost no-confidence votes by local party members in their constituencies. Joan Ryan and Gavin Shuker dismissed the votes - which carry no official force in the party - and said they would carry on as usual, with Ms Ryan blaming "Trots, Stalinists, Communists and assorted hard-left" for the 94-92 vote defeat. Others to have lost similar votes include Frank Field, who quit the parliamentary party last week citing the handling of the anti-Semitism row and bullying in local constituency parties and Kate Hoey. Graham Stringer won a confidence vote in his constituency. Chuka Umunna, a leading member of the cross-party People's Voice campaign for a second EU referendum, has written to members of his local Labour Party in Streatham, south London, to deny reports that he is involved in talks about a new party, the New Statesman reports. 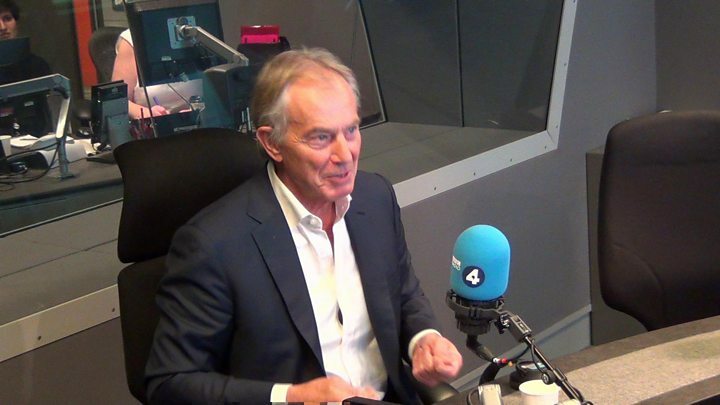 Speaking on Nick Robinson's Political Thinking Podcast, Mr Blair said: "I don't think the British people will tolerate a situation where, for example, the choice at the next election is Boris Johnson versus Jeremy Corbyn. "I don't know what will happen and I don't know how it will happen. "But I just don't believe people will find that, in the country as a whole, an acceptable choice. Something will fill that vacuum." He said there was a large constituency of voters who backed "socially liberal, progressive" politics but also believed in "a strong private enterprise sector alongside a state that is capable of helping people". Mr Blair's name has been linked with the formation of a new "centre ground" party, although he has never publicly backed the idea. And the former prime minister told Nick Robinson he was not as pessimistic as some of the people around him about the chances of his wing of the party regaining control of Labour. "There [are] lots of people associated with me who feel that the Labour Party is lost, that the game's over," he said. "I am hoping they are not right." But he said the anti-Semitism row that had engulfed the party was "bad because it has been, in the end, something that I just can't imagine ever having happened in the Labour Party that I joined". "I can't imagine that we have had three to four months debating over something where we have profoundly insulted the Jewish community in our country," Mr Blair said. He said the current Labour leadership came from a left-wing tradition opposed to Western foreign policy. Those belonging to that tradition had always been "on the margins" of the party or in a different party, such as the Communists or "Trotskyist groups", he added. Mr Blair is a persistent critic of Mr Corbyn's leadership and warned in 2015 the Labour Party risked "annihilation" if he became leader. 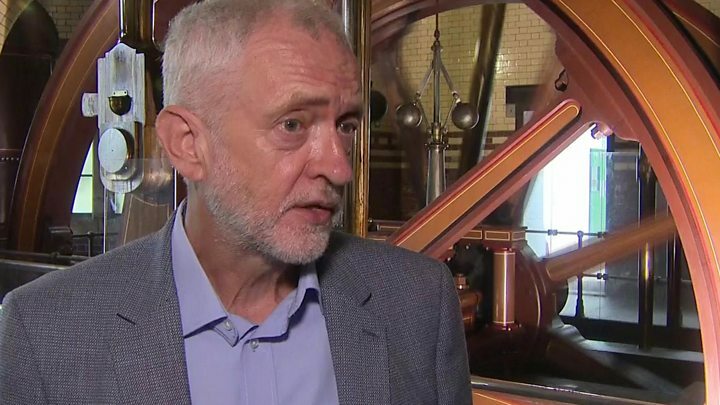 Last year he told the BBC he accepted it was "possible" that Mr Corbyn could become prime minister, in the wake of the 2017 snap election in which Labour defied predictions of a heavy defeat. Under Mr Corbyn's leadership, party membership has swelled from 388,000 at the end of 2015, to a reported 540,000 as of April 2018. Under Mr Blair's leadership it reached a peak of 405,000 in 1997 before falling to 198,000 by the time he left Downing Street. Labour backbencher Chris Williamson, an ally of Mr Corbyn, told BBC Radio 4's Today programme: "I don't really understand what Tony is talking about, the Labour Party now has never been more united. "We achieved nearly 13m votes in the last election and we are giving hope to millions of people who had become really cynical about politics and inspiring people in a way that I never witnessed in my 42 years as a Labour Party member. "So I think the party is going frankly from strength to strength." And Jon Lansman, founder of the pro-Corbyn Momentum movement, said the party would "never" return to Mr Blair's policies. He said on Twitter: "Tony Blair was never in the right party and there will never be a return to his politics in UK Labour." The National Executive Committee member said that Blair-era policies like the minimum wage and Sure Start nurseries should be credited to other leaders. "Sure Start thanks to Gordon Brown, Min Wage thanks to John Smith, the tragic lost leader we should have had as PM in 1997," he wrote.